Wolves Athletics Club runner Jamie Wigmore captured her first provincial Senior Women’s title on Saturday by winning the 1000m at the AB Indoor Games in Edmonton. Wigmore outkicked Legacy Athletic’s Vanessa Ivec in the final few metres recording a personal best time of 2:57.41. 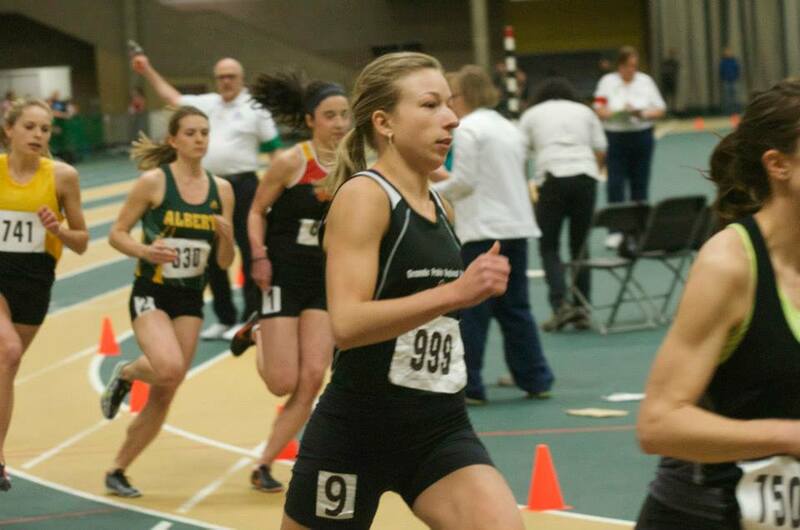 On Sunday, Wigmore placed second in the 1500m behind University of Calgary’s Sarah MacArthur. The Wolves athlete stopped the clock in another personal best time of 4:40.30, five seconds back of MacArthur. Both of Wigmore’s performances were new Wolves School records. Wolves Hayden Hollowell also had a notable meet, breaking the nine minute barrier for the first time in the 3000m. Hollowell clocked a time of 8:58.39, good for 6th place in the Senior Men’s race. Former Wolves athlete Joren Manz, now running for the University of Alberta placed 5th in the Senior Men’s 300m. Wolves runners next see action on Feb. 27 and 28 when they compete in the 2015 ACAC Indoor Track Championships in Edmonton. This entry was posted in Indoor Track and Field, Uncategorized and tagged Athletics Alberta, GPRC Wolves Cross Country, Grande Prairie, Hayden Hollowell, Indoor Track and Field, Track and Field, Wolves Athletics Club. Bookmark the permalink.